October 31st. Halloween. A holiday with roots in Celtic tradition known as Samhain, adopted by Christian’s as the holy day of All Saint’s Day and eventually made it’s foothold as a great North American Traditional celebration in 1846 when Irish immigrants brought their own versions of the celebration to us. It’s a holiday steeped in folklore, ritual, and mystery. But many of us lose sight of how important a role this day is for us. Yes, Halloween has become an enormous commercial and marketing jackpot in recent years but one must never lose sight of the true Halloween spirit. As fall sets in, as the leaves turn brown and leave barren, skeletal trees, as the temperature drops and the wind chills our bones…we are reminded that one day we too shall fade away. On this one night a year we are allowed to be whomever we’d like to be, hide behind masks, beg for candy, and be one with the spirits of those who’ve come before. Halloween is a celebration of life in the face of death. It’s a dark celebration filled with fun, danger and excitement. 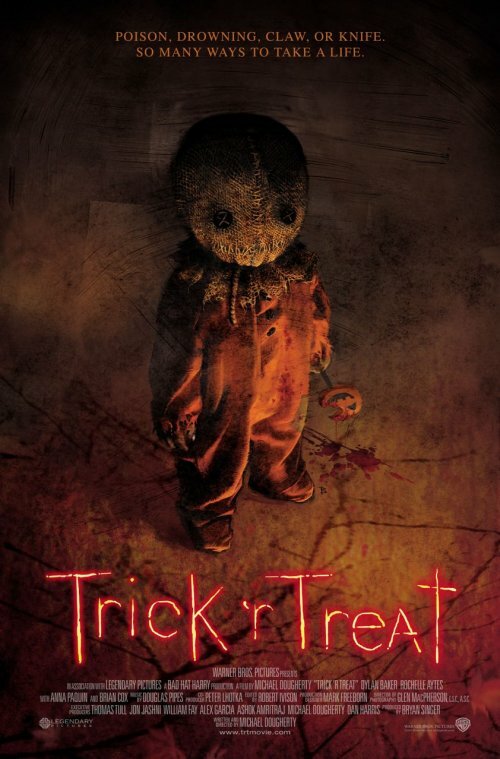 And Mike Dougherty’s recently released horror anthology Trick R’ Treat evokes everything we love about Halloween. Trick R’ Treat involves several different interweaving storylines that take place on one night introducing us to some truly bizarre, memorable characters and towards some very twisted endings. It’s a film populated with ghouls, creatures, human monsters and illustrates the evil they are all capable of. The film features middle aged Halloween tricksters who ends up down in the dirt, a vampire run amuck, a young woman looking for just the right man for her first time, a group of children paying their respects to those who passed in a ghastly town legend, an elderly shut in who refuses to celebrate the holiday and a young woman who makes the mistake of blurting out her hatred for Halloween. All the while the short figure of Sam Hain watched from the shadows. In this stocky, silent, central figure to the warped tales told here, Dougherty has created a new horror icon sure to take his place amongst the pantheon of cinema heavy weights as the cult status of this film grows and the possibilities for follow ups grow stronger. The performances here are all strong, from veteran actors such as Brian Cox (Manhunter) & Dylan Baker (Spider-Man series) who tap into some pretty nasty places for their character motivations. Also on hand are some fresh faces such as Lauren Lee Smith(CSI), Quinn Lord (as Sam) and Oscar winner Anna Paquin (TV’s True Blood) looking sexier than ever in a Little Red Riding Hood costume and sporting her dark hair from back in the day. Not to give too much away, but when Marilyn Manson’s cover of Sweet Dreams starts playing, Anna has never EVER looked sexier. Anna Paquin is hungry for love in Trick r' Treat. The production quality here is tight and perfectly captures the atmosphere of a whole town brimming with the Halloween spirit and I could not contain the smile that spread across my face in delight of the successful tone Trick r’ Treat sets from the first frame to the very last. I also appreciate that writer/director Mike Dougherty never once dumbs down the proceedings in order to spoon feed the audience and stays focused on delivering the greatest on screen celebration of our beloved holiday since John Carpenter’s original Halloween back in 1978. Trick r’ Treat is a collection of some of our all time favorite classic monsters and a brilliant assortment of some new beasts to add to our cultural Halloween mythos. Trick r’ Treat is a horror classic in the making and you truly feel like you’re a part of something very special as you watch it. Halloween spirit incarnate. Mr. Sam Hain makes a house call. So obey the rules this Halloween, and if you’re lacking a bit of that old Halloween spirit, check out Trick r’ Treat. It will reignite that inner jack-o-lantern in no time. « Nut Up. It’s time for Zombieland!